1. There are believed to be about 280 different squirrel species in the world today. 2. The squirrel’s muscular hind legs help it jump distances of 20 feet into the air. 3. A squirrel’s bushy tail actually serves a couple of purposes. For one, it helps them balance when they are walking along branches. It also serves as a type of parachute. Squirrels can fall from a height of 100 feet and land on the ground without getting hurt because of its tail. Its padded feet also help soften its landing. 4. The gestation period for a squirrel depends on their size. Smaller squirrels can have a gestation period of about 33 days while larger ones may have a period of 60 days. 5. A male squirrel spends twice as long grooming itself than a female squirrel takes to groom herself. 6. Squirrels are found on every continent except Antarctica and Australia. 7. 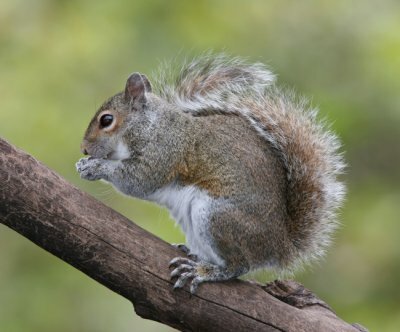 A squirrel’s brain is about the size of a walnut. 8. Squirrels can reach a top speed of 20 miles per hour when they are running. 9. A squirrel’s appetite is huge. They can eat an amount of food every week that is equal to their body weight. 10. Squirrels have very sharp teeth that continue to grow during their lifetime. They use these sharp teeth to crack nuts and for chewing through things when searching for food. 11. For the most part, squirrels are omnivores. They typically eat seeds, fruits, nuts, flowers and tree back. At times, they might also eat insects, small birds and even small snakes, although the latter is very rare. 12. Generally, squirrels are solitary creatures. During the colder months, however, they will share a nest with other squirrels to help each other stay warm. They also get together for mating. 13. Squirrels do not hibernate. They do, however, stay in their nests during the winter months. This helps them save their energy so they can stay warm. 14. A litter of squirrels consists of between 2 and 8 baby squirrels, or kittens. When they are born, they are blind. 15. Mother squirrels take the full responsibility of raising the offspring. The male squirrels do not do anything to help raising the young squirrels. 16. Most species of squirrels reproduce twice a year. There are a few species, however, that only reproduce once a year. 17. Ruling out attacks by predators, a squirrel can live between 10 and 12 years in the wild. 18. The main predators of squirrels include owls, opossums, foxes, hawks and wildcats. 19. There is a breed of squirrel named the flying squirrel. However, despite the name, these squirrels cannot fly. Instead, they glide through the air with the help of a special type of skin that extends. They can plunge 150 feet by gliding. 20. The African pygmy squirrel is the smallest of all squirrels. They only grow to be about 4 inches tall. 21. The squirrel’s fur is soft and silky to the touch. 22. Squirrels talk to each other with a series of chirps. They can communicate feelings like laughter as well as alert other squirrels to danger. The chirps are used in combination with their tail movements for a variety of signals. 23. Before hiding food for the winter, a squirrel will often rub it on its face. This puts their scent on the food so they can easily find it later. They can find it under a foot of snow if it has their scent on it. 24. Squirrels almost never come out at night. They take care of their daily activities a few hours after sunrise, rest during the afternoon, and then finish a couple hours before sunset. They will then return to their nest for the evening. 25. A squirrel’s eyes are positioned so they can see behind them without turning their heads.